Heading into the season, the Bruins faced a little turmoil. Goalie Tim Thomas decided he’d like to take a year off from hockey. This following his insane Facebook posts regarding politics and his decision to boycott a team visit to the White House. In stepped Tuukka Rask, Thomas’ backup and an emerging star. The Bruins wound up being apart of the cream of the crop in the Eastern Conference. The Pittsburgh Penguins ran away with the conference, backed by so much talent that they could sustain the loss of Sidney Crosby for a chunk of time. Turns out that talent thing is helpful. The Bruins also found competition from division rival Montreal. The Canadiens weren’t expected to be much of anything but wound up finishing as the second seed in the East, winning the Northeast Division. As the fourth seed, the Bruins rolled into the playoffs and nearly blew a 3-1 series lead, dropping games five and six before falling behind 4-1 in the third period to the Toronto Maple Leafs. A frantic comeback later and the Bruins were on their way. Rolling through the New York Rangers in five games and then sweeping the mighty Penguins in the Eastern Conference Final, the Bruins squared off against the Chicago Blackhawks in an epic final, losing in six games. When you make a run to the Stanley Cup Finals, people gots to get paid. And paid they gots. Rask and Patrice Bergeron, who proved to be the world’s toughest man during the Final, both got eight-year deals; Bergeron’s for $52M, Rask’s for $56M. Jaromir Jagr, who became everyone’s favorite “legend who could be on the way out” was on the way out – just to a new team for this season. Replacing him? Jarome Iginla and some sweet, sweet irony. Why? Oh, you know, that whole episode where the Bruins thought they had a deal with the Flames at the trade deadline to land the veteran scorer only to be rebuffed by Iginla so that he could go to Pittsburgh. Which must’ve made that sweep in the Conference Finals even more sweeter. If only we’d had GM Peter Chiarelli mic’d up for that. Also gone? Young stud center/winger Tyler Seguin. Turns out, the Bruins didn’t take real kindly to the fact that he was partying like Patrick Kane but not scoring like him. Repeated warnings, a supposed sentence of house arrest in his hotel room, and angry public statements from Chiarelli weren’t enough to straighten him out and next thing you know, he’s gone to Dallas where he immediately made a gay joke that no one found funny. Coming back is everyone’s favorite underrated winger, Loui Eriksson. Not a bad deal. Funny enough, the Sabres seemed to have focused all of their off-season efforts last year solely on competing with the Bruins. After the Ryan Miller/Milan Lucic incident of the previous year, in which Lucic bowled over the Buffalo netminder and didn’t even have to fight anyone afterwards, the Sabres looked to get bigger and tougher and focused less on actually winning hockey games. They brought in Steve Ott, who proved to be the guy you love on your team but absolutely despise if he’s not, and giant tough guy John Scott whose season basically encompassed no one wanting to fight him after he KO’d Boston’s Shawn Thornton. Still, the clearly overmatched Sabres managed to play the Bruins tough. They took three of five from the B’s and played them tight in both losses. 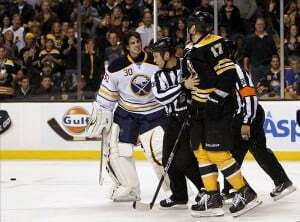 Turns out, Ryan Miller also enjoys playing the Bruins. He earned a three stars of the game nomination in every game according to NHL.com and flat out stole two games and nearly a third. The Sabres seem to amp themselves up for the Bruins and as long as Miller and Lucic are on opposite sides, there will be fodder to get the Sabres ready to play the big, bad Bruins. The NHL regular season schedule was released on Friday. Check out our partners at TiqIQ for the best deals on Buffalo Sabres tickets for all 2013-14 games.